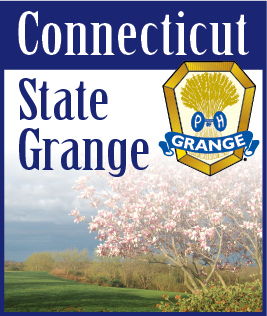 Connecticut will host The 98th Annual North East Grange Lecturers’ Conference August 5, 6 & 7, 2013 at Albertus Magnus College, in New Haven. This is the first time in some years that the conference has been in Connecticut and I am hoping for a big turnout of our members. The conference will begin with registration from 1:00 p.m. to 3:00 p.m. on Monday, August 5th. The first workshop will begin at 3:30 p.m. with the Formal Opening at 7:00 p.m. Our theme this year is Community Spirit and Spirit Night will replace North East Night with a new agenda giving each state a chance to show off their spirit and talent. Spirit night will begin Tuesday, August 6th at 7:00 P.M.
A lot of help is going to be needed before and during the conference. Connecticut’s Program will be entitled Health Care. If you have a skit, a joke, or any other number that relates to Health Care, I would appreciate it if you would share it with us. These do not have to be serious numbers. While health care is a serious business, residents of convalescent and rest homes need good entertainment. Other State programs are on Our Heritage, Public Safety, Events, Public Buildings, Organizations and Places of Worship. There should be a lot of ideas in these programs that can be used in our local Granges. The workshops are also aimed at keeping our members informed and entertained. It is hoped that Granges around the State will support their Lecturer by paying for them to attend the conference. The cost of the complete conference is $205 for a single room or $195 for a double room. Information and registration forms will be in the mail to all Lecturers and regular attendees by May 1st. If you do not normally attend, but want to go this year just drop me a line or see me as I travel around the State.